Actress Han Ji Hye (한지혜) who was my favorite of the night wore a dress from Christian Dior Pre-Fall 2010 collection. Her look was completed with a pair of boots and clutch. Actress Choi Ji Woo (최지우) also wore a look from Christian Dior Pre-Fall 2010 collection. The top features feathers along the neckline. Unfortunately, the photographer wasn't able to capture the beauty of it. The only female actress who wasn't in a dress was also my favorite. Han Chae Young (한채영) was a disappointment for me. 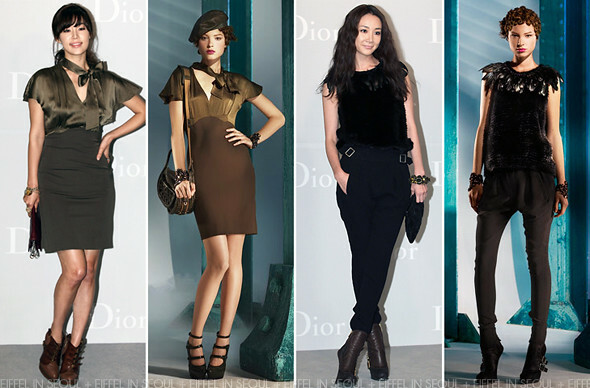 The actress/model wore a runway look from Christian Dior Fall 2010 collection. Ever since I saw those fugly-colored boots on Zhao Wei (赵薇), I can't bring myself to even like them. Aside from the coat, I thought Kim Jung Eun (김정은)'s outfit was nothing but a mess. She wore a dress from Christian Dior Fall 2010 collection with some really ugly boots and clutch. Jo Yeo Jeong (조여정) was the only one in a bright colored dress. Her Christian Dior Pre-Fall 2010 dress was paired with a pair of boots and a white Dior clutch. I wished she wore the sandals from the same collection and carried a smaller clutch. Cheong Jeong Myeong (천정명) and Joo Jin Mo (주진모) were the only 2 males who attended the fashion show. While Joo Jin Mo (주진모) looks great in a tuxedo, Cheong Jeong Myeong (천정명) looks like a dumping to me. Those pants are tooooooo short! hahaha i dont think they're that bad, but I am loving choi ji woo feather top with those pants and boots!